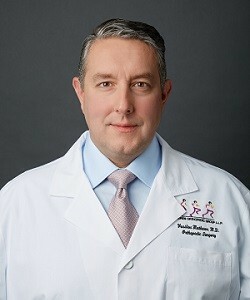 Vasilios Mathews, M.D., specializes in joint replacement surgery, including surgery via minimally-invasive joint replacement techniques. 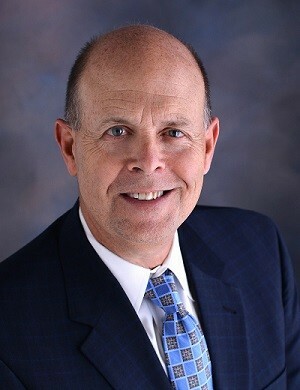 Dr. Mathews has extensive experience with bone-sparing procedures, including partial knee replacement and hip resurfacing, as well as with the newest innovative techniques, including anterior hip replacements and the use of low-wear joint replacements. His specialization also includes revision of certain failed prior hip surgeries and prior knee surgery, and failed knee replacements. Dr. Mathews is a member of Fondren Orthopedic Group and practices at Texas Orthopedic Hospital. He is proud to offer his care entirely by himself, including daily rounds and direct patient care. A native of Connecticut, Dr. Mathews obtained his medical degree from Columbia University College of Physicians and Surgeons in New York. He began his postgraduate training at Lenox Hill Hospital in New York where he was named Chief Orthopedic Surgery Resident. Dr. Mathews completed his fellowship training at the Mayo Clinic in Rochester, Minnesota, where he specialized in adult lower extremity reconstruction. Dr. Mathews has many publications and presentations to his credit. He is a member of: American Academy of Orthopaedic Surgeons, American Association of Hip and Knee Surgeons, Houston Orthopedic Society. He is excited to be joining the Arthritis Foundation as the 2019 Medical Honoree to support the organization’s efforts, which directly impact his patients. Dr. Mathews himself has had his hip replaced for arthritis and is able to empathize with those suffering from the daily pain of their joint disease. Join Dr. Mathews in supporting the Walk to Cure Arthritis, and help him reach his $10,000 goal. Dr. Eisenberg is a Rheumatologist offering a designed-for-comfort infusion suite on site where patients are able to receive intravenous medications. Dr. Eisenberg is originally from Akron, Ohio. She double majored in Biology and Psychology at John Carroll University. During that time, she was a member of the Alpha Epsilon Delta Honor Society and Psi Chi Honor Society. She received her medical degree from Lake Erie College of Osteopathic Medicine. During medical school, she was honored to serve as Vice President of her class. 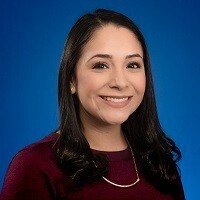 She completed her residency at the Cleveland Clinic foundation, Akron General followed by her Rheumatology fellowship right here at University of Texas Medical Branch, Galveston. She was also awarded the President's Cabinet Award in Helping Osteoarthritis Patients Project from the University of Texas. Dr. Eisenberg has been apart of many publications in well respected journals . She was featured on the cover of a local magazine, Change, recognizing her contribution to treating Osteoporosis during National Osteoporosis and Prevention Month. Additionally, she is a principal investigator in numerous current clinical trials involving Rheumatoid arthritis, Gout , Lupus and Psoriatic arthritis. 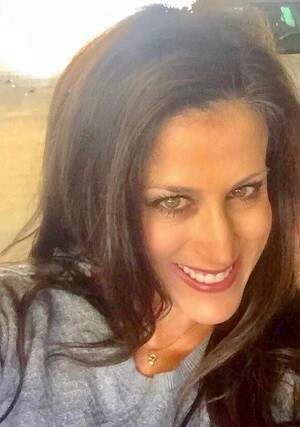 As an active member of the Harris County Medical Society, she participates in numerous continuing medical education activities in the Houston community. As a dedicated physician, she is eager to raise awareness about what a rheumatologist can do for patients who are fighting these rheumatic conditions. It is her mission to improve the quality of her patients lives while providing them with valuable resources in a friendly and professional style. Dr. Eisenberg is excited to be joining the Arthritis Foundation as the 2019 Medical Honoree to support the organization’s efforts, which directly impact her patients. Join Dr. Eisenberg in supporting the Walk to Cure Arthritis, and help her reach her $10,000 goal. diverse cross-functional teams to success in the media industry. Mark's strengths range from from talent recruitment to sales revenue management and he is a widely known for his ability to effectively groom leaders to become high performers. It's the continual evolution of media that fuels his passion for the industry and he welcomes any opportunity to use this passion to support non-profit organizations like the Arthritis Foundation. Mark and his family are personally affected by arthritis. His daughter, Kerry, was diagnosed with Rheumatoid Arthritis in her 20’s. Kerry struggled to find a treatment plan and medications that worked for a number of years. Mark and his family turned to the Arthritis Foundation in 2016 for guidance and a support network. Mark credits the Foundation to helping Kerry finding a treatment regimen that put her into remission. To support Mark’s efforts in the Walk to Cure Arthritis. Cristina was diagnosed with Rheumatoid Arthritis (RA)15 years ago. able to live a “normal” life again. Several years later, she and her husband decided to start a family. can get her back to a controlled state. successes give her hope for the future. To support Cristina in the Walk to Cure Arthritis and help her reach her goal of $5,000. 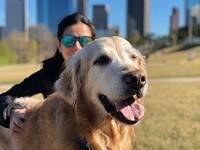 Max is a 13-year-old Golden Retriever from Brenham, Texas. He was brought home by his dad in 2006. This is where Max experienced the college life! Max has made an impact in the lives of those who surround him. He constantly reminds others to smile just by looking into their eyes. Max loves to go for long walks at the park. Before his diagnosis, he was an avid long distance runner. He trained with his mother and grandfather for half and full marathons in the hot Houston summers and in the bitter cold winters of Chicago. He averaged 10 miles a day, 5 days a week for many years. He encountered many medical issues throughout his life, but was always able to make a full recovery until he was diagnosed with a severe case of spondylosis of his entire lumbar spine. The doctor said it is the third worst case he has seen. He currently receives chiropractic care, acupuncture and laser therapy to manage his discomfort, takes medications and has a grain free, balanced diet filled with turmeric, to manage his body weight, which puts less pressure on his joints. Since starting his treatment in November 2018, Max has experienced significant improvement in his mobility skills. Despite experiencing the arthritis pain, he is still very playful and full of energy and never rejects an invitation for a car ride or walk in the park. Needless to say, Max continues to make an impact in the lives of others by bringing so much optimism, positivity, joy & love into their lives. He is excited to be this year’s Canine Honoree to spread the word that Dogs Get Arthritis, Too! Please join Max in supporting the Walk to Cure Arthritis, and help him reach his $1,000 goal.